Years ago, when I was a student and young professor in Berkeley, one often heard it said that the subject of logic or at least metamathematics, according to the Tarski school, could be divided into four subjects: model theory, set theory, computability theory (then called recursion theory) and proof theory. I have long felt that this taxonomy has become increasingly inadequate as a description, and so at the start of my course Logic for Philosophers yesterday, I tried to draw a somewhat fuller picture on the whiteboard. 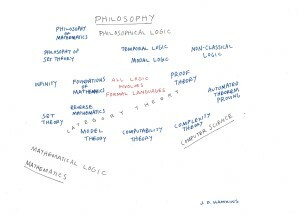 You can see my diagram above, showing the main parts of logic, occupying regions both within mathematics, within philosophy and within computer science, as well as filling out regions that might be considered between these subjects. OK, this picture is a first attempt, and I’ll try to improve it. Please post comments and criticisms below. It would certainly be possible to flesh out subareas of nearly all the subjects mentioned. We may imagine set theory, for example, broken into descriptive set theory, Borel equivalence relation theory, large cardinals, forcing, cardinal characteristics, and so on; and similarly we may break up the huge subjects of model theory, computability theory and proof theory. In particular, most subjects don’t fit neatly into a small region, since almost all the subjects have parts that touch areas very far away. Computability theory, for example, touches not only complexity theory and computer science, but also model theory in computable model theory, as well as reverse mathematics, foundations of mathematics, proof theory and so on. Category theory is a kind of diffuse superposition onto the entire diagram, with comparatively less direct interaction with these other areas. Proof theory should be closer to reverse mathematics and to model theory, and probably closer to mathematics. This entry was posted in Exposition by Joel David Hamkins. Bookmark the permalink. As you say, all of these areas are interconnected, some more than others. I wonder about the three corners philosophy, math, CS — are you trying to suggest a closer relationship to the areas of logic near them than to others? Is “Philosophy of math” an area of logic in this picture? A stretch, I think, and also an exception to the claim in the middle “all logic involves formal languages”. (Infinity, perhaps, also doesn’t, if seen as distinct from set theory). 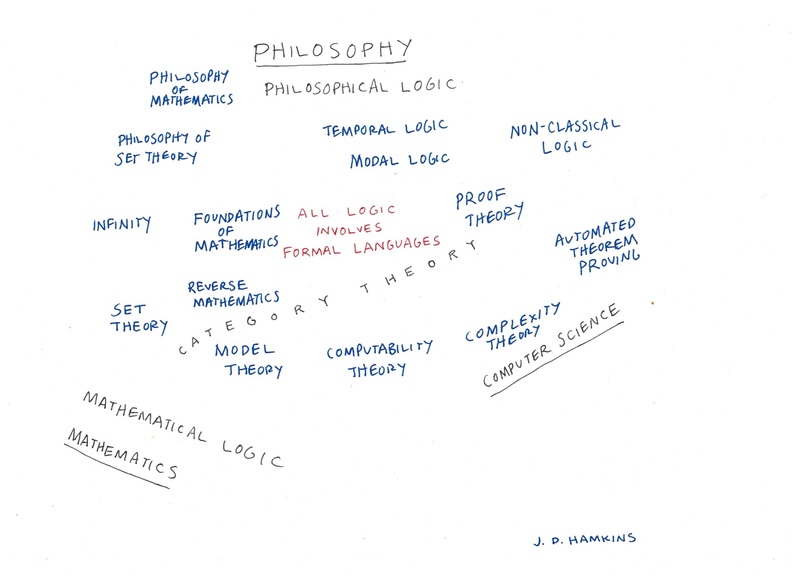 I agree that we don’t regard philosophy of math as a subarea of logic, although I believe it does have strong connections with many parts of logic, and so I thought it belonged on the chart as much as philosophy and mathematics themselves do! And I also agree that the parts of the study of infinity that don’t have to do with formal languages are the parts that are less connected with logic. Perhaps what is surprising is that so much of our understanding of infinity, in the large cardinal hierarchy, is wrapped up with our analysis of the expressive power of various languages. This is quite explicit, for example, with the reflective cardinals or the weakly compact and strongly compact cardinals, but also with any large cardinal defined in terms of elementary embeddings of the universe, since these are elementary with respect to some formal language. I have qualms about the triangle philosophy, math, CS: the diagram suggests that the closer an area of logic is to one of those corners, the closer the association, But I don’t see a clear pattern. Closer in influence/motivation for the are of logic? More important in applications to the corners? Closer in historical connection? Modal and tense logics are often considered non-classical logics in the sense they are not (just) classical first-order logic. So for non-classical you mean “alternative” (eg intuitionistic)? Where would second-order, infinitary, non-monotonic, fit in, and which of these live close to philosophy, which onees close to math, which ones to CS? Candidate for a fourth corner: linguistics. I had placed model theory and set theory closer to mathematics than to philosophy or computer science, because they are more mathematical in nature and more deeply connected with issues in mathematics. Computability theory has parts that are more connected with mathematics and parts that are more connected with computer science, so that also seems clear. Foundations of Math is clearly moving toward philosophical issues, but reverse mathematics is a part of it that remains more closely connected with mathematics. If I were to add second-order or infinitary logics, which I regard as classical as opposed to non-classical, I would put them near set theory and infinity. I am surprised to hear that you would regard modal logic as non-classical, since I take it as classical (although of course one can also do modal logic non-classically). For example, the Kripke semantics are mainly investigated with classical logic. For me, the non-classical label applies when one drops LEM or non-contradiction. I didn’t mean much by the colors, except to help distinguish the areas, and I don’t believe that there is a sharp boundary between what counts as logic and what doesn’t. See what I wrote on the distinction between mathematics, meta-mathematics and meta-meta-mathematics: http://mathoverflow.net/a/172848/1946. I think the label “non-classical” is commonly used to cover everything other than classical propositional and predicate logic — you’d expect a book on non-classical logic to cover modal logic! If you want to be more discriminatory, you could use “extensions of classical logic” and “alternative logics”. I’d think these are by now probably all equidistant between philosophy and CS. I think second-order and related (fixpoint operatores, etc.) formalisms play a more important role in CS than in math (think esp. finite model theory and database theory). Thanks so much for your comments! I think the second version will be much improved. But I think your remarks indicate an overly narrow conception of classical logic! I don’t think I can agree. For example, most people regard Boolean algebras (and therefore Boolean-valued models, forcing etc.) as part of classical logic. I believe that this is mainly because Boolean-algebra logic has all the same classical validities as classical propositional logic, even though they involve multi-valued truth, whereas Lukaciewic 3-valued logic is non-classical, because the validities are not the same. To my way of thinking, the classical/non-classical distinction turns on the question of whether the validities such as LEM and non-contradiction are still present. You are right about the fix-point formalisms being close to CS; meanwhile other second-order logic is closer to math, as in second-order number theory, reverse math, and second-order set theory (Goedel-Bernays, Kelley-Morse etc.). Yeah but those aren’t *really* second order: they’re just first-order with two sorts, one for numbers and one for sets of numbers. Anyway, I don’t think much hinges on the definition of “classical” logic; I’m just reporting that modal logics are usually considered to be part of what goes under the label “non-classical logic”. Well, of course one can say that about any instance of second-order logic, but in any case, it simply pushes second-order logic even closer to set theory in my diagram, since if one wants to insist on “real” second-order logic, then one is actually doing set theory, where the answers to fundamental questions about the nature of the logic amount to set-theoretic commitments. On that perspective, “real” second-order logic becomes set theory. As for the classical/non-classical label, it seems that you may be right, even if I find that usage to muddy the waters. I don’t use the terminology that way myself, and I shall continue to regard Boolean-valued truth (even with a nontrivial Boolean algebra) as fundamentally classical. I think the best place for “constructive mathematics” within the original picture is where “all logic involves formal languages” currently stands. (Ironically, perhaps, I think Brouwer would have objected to that statement. Though perhaps he wouldn’t characterize his work as logic per se.) I’m at a lost to find a new place for that very interesting statement. Perhaps in a circle around the picture? Perhaps a minor adjustment: I would put “non-classical logics” to the left of “temporal logic” and “modal logic”, and “modal logic” above “temporal logic”. The rationale is that, as far as I understand, this is the ranking of their relevance to computer science in the south-east corner. Can linguistics have a place in this diagram? If yes, where? Clearly it has a family relation. Where would you suggest? If linguistics is to be included, philosophy of language must be included too, between philosophy of logic and linguistics. I propose linguistics as a fourth corner to the picture. Also it may be to distinguish philosophical logic from philosophy of logic, which is absent in the picture. So, the philosophies of logic, language and mind would be located between philosophy and linguistics. Dear Joel, I really have no idea! Dr. Fallahi already presented a philosophical logician’s technical point of view. I think it depends on methodology of our linguistics, maybe near to philosophy, maybe near to computer science or both! If it is okay, I will refer to this descriptive diagram as “where we live” in some upcoming lectures. It would be very nice if you upload updated versions periodically.